The Cold War Air Museum once again joined with the DFW wing of the CAF to put aircraft on exhibit for this annual event at the Lancaster Airport. An estimated 6,000+ people attended the day long open house this year. With dozens of aircraft on display and dozens more flying, it was a busy and exhausting day for the Cold War Air Museum and Commemorative Air Force volunteers working at the show. The MiG-23 was popular. Homer and Jon assisted visitors and answered questions throughout the day. The MiG-23, MiG-21, L29, L39 and CJ were on display. Pete assisted visitors with the UH-1. In addition to the UH-1B, AH-1, Mil-2 and Mil-24; a Bell47, UH-1H, Chinook and Black Hawk also flew to the event. Zane, from Warbird Radio is shown here interviewing Phil Davis, one of the Directors of the museum. Phil's jeep, in the background, was called into extra service for moving aircraft and people from the museum to the display area and back. Technically a MUTT (Multi purpose utility tactical truck), it is also an authentic relic of the Vietnam era. Of course a number of the aircraft associated with the museum also flew. Larry and Johnny are shown here in the Mi-2. 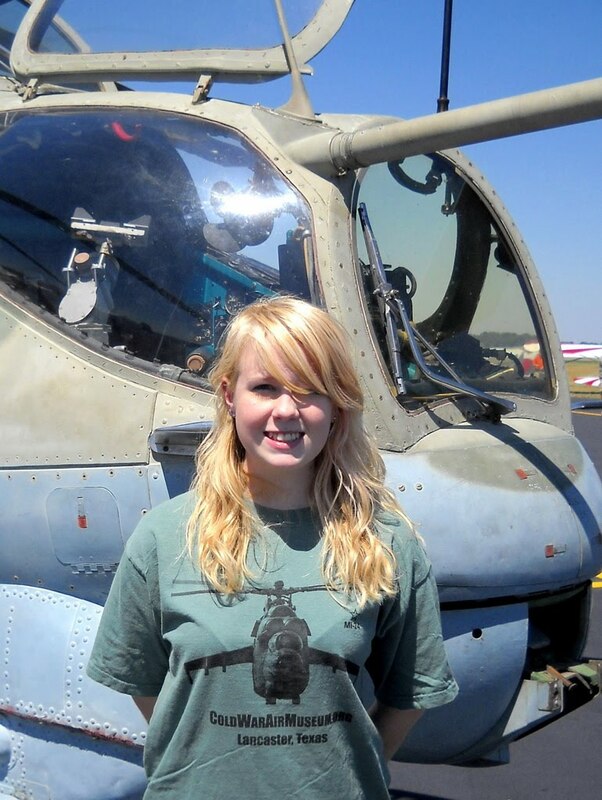 As usual, the Mi-24 was a hit with the crowd. One of the Army Blackhawk aviators was heard to remark "Holy Cow" (or words to that effect), while watching the Hind in flight. We appreciate the contribution of the First Cav bringing their Black Hawk and Chinook to the show. Our Hind and Hoplite will both be going to the airshow associated with Ft.Hood next weekend and we look forward to a report and pictures from that event. We've recently reloaded the T-shirt locker. One of our volunteers is shown here wearing one of the new designs. Another of the new series which features our Huey is demonstrated by another of the volunteers.We hope these will be a hit at the upcoming events and plan on having these, and other new designs available online soon. Love the MiG-23. Here are some more WW2 aircraft museums.